Just when you thought you found the right place to settle down you have to move … again! It can be frustrating moving from one place to another, no matter the reason for the relocation. Some persons have to move constantly because of their jobs or maybe the neighbourhood they thought was “so great” was in fact not really what they expected. So off they go again to somewhere new. For such ones, their belongings have to be moved too, which is another headache in itself. There are times when you can’t carry all your belongings at one time with you when you move, so the need for self storage comes into play. I am not talking about storing the stuff yourself at a friend or family members home. I am referring to personal self storage containers that are safe, durable, and weatherproof. ABF U-Pack Moving, Inc. supplies these containers, known as the ReloCube, and will drop them off at the residence that you are moving from, pick them back up in a few days, store them in a safe location until you are ready, and then deliver them to your new location. You keep the key for your container so that no one else will have access to it. 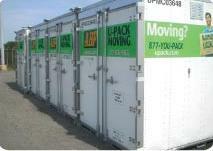 For each 30 day period of storage, the prices range from $75 to $195 per container, and from $395 to $595 per trailer. So worry no more about where to store your stuff when you are moving. Let ABF U-Pack Moving, Inc. put your mind at ease.